I ran into a problem when trying to setup my iCloud account with Apple. 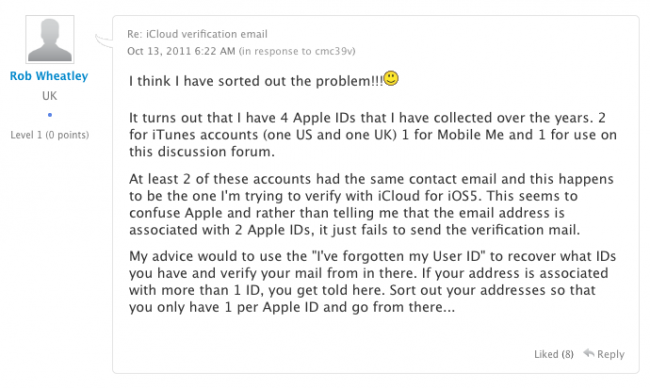 No matter what I did, I couldn’t figure out how to complete the verification email part of the setup, as Apple needed my Apple ID to be an email address (the one I was using was not). I tried a few things and had no luck figuring out the problem. Come to find out, it looks like I had multiple Apple IDs related to the same email account. A very nice guy by the name of Rob Wheatley posted the fix in Apple’s discussions. I first went to appleid.apple.com and clicked the Find out link at the bottom right of the page. 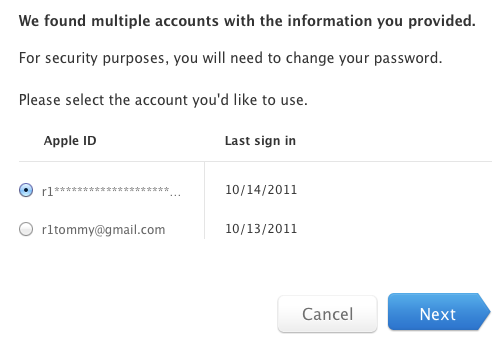 I was then shown two Apple ID’s that were associated to my email address. I logged into my r1tommy@gmail.com Apple ID (the account that I never used) and changed it to r1tommy@hotmail.com (now r1tommy@gmail.com is only associated to my r1tommy Apple ID account). I then logged into my r1tommy Apple ID (all my apps & music is purchased on this account). I was given the option to merge my r1tommy Apple ID & r1tommy@gmail.com together as one (like two peas in a pod), making my r1tommy@gmail.com my primary Apple ID. Everything then fell into place and worked seamlessly.